Co-operatives are democratic corporations with considerable investor protections and director accountability mechanisms built into the legislation under which they are incorporated. Because each member has only one vote no matter how many shares they hold, co-ops are unattractive vehicles for anyone seeking to take advantage of small investors. 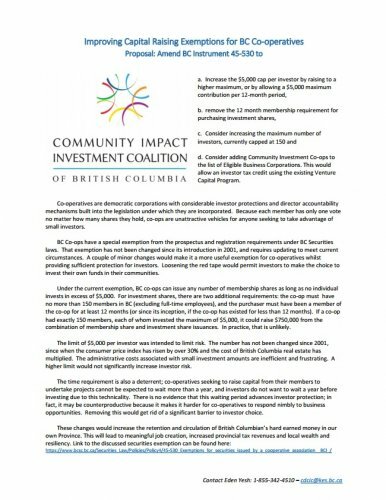 BC Co-ops have a special exemption from the prospectus and registration requirements under BC Securities laws. That exemption has not been changed since its introduction in 2001, and requires updating to meet current circumstances. A couple of minor changes would make it a more useful exemption for co-operatives whilst providing sufficient protection for investors. Loosening the red tape would permit investors to make the choice to invest their own funds in their communities. d. Consider adding Community Investment Co-ops to the list of Eligible Business Corporations. This would allow an investor tax credit using the existing Venture Capital Program.